Click on a link below to learn more about the Internet browser, as well as general help for Internet-related questions. How do I view my Internet browser's history? Why does a browser need to save my history? How can I change my browser's home page? How to change the default language of an Internet browser. How to access Internet browser settings. How do I open a new tab in an Internet browser? How to cast a website or Windows desktop to a TV. How do I set my browser to Incognito or private mode? How to show or hide the bookmarks or favorites bar. I think my web browser has been hijacked. How to enable/disable a browser's autocomplete feature. How to import and export browser bookmarks or favorites. How to change the size of fonts in your browser. How to restore default settings in your Internet browser. Change how your browser handles PDF files. Removing the browser's printed page header and footer. 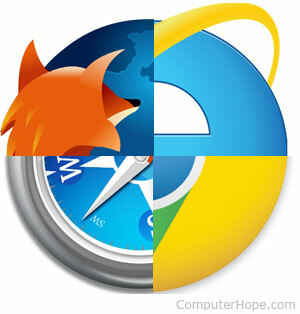 How to determine the version of your Internet browser. How do I enable and disable autofill in my browser? How to disable or remove browser extensions. How to disable animated pictures in browsers. How to view your browser window in fullscreen mode. How to download videos using a browser add-on or extension. How to remove an Internet browser toolbar. Full list of questions and answers relating to the Internet. Full list of e-mail-related questions and answers. View your browser's settings, plugins, and system information. Undo a closed Internet browser tab. Move back faster in your browser. Make the browser window full screen. Find forgotten pages in your browser's history.